In a government notification on Monday, the Indian government claimed that it has deferred implementing higher tariffs on some goods imported from the US to November 2. India and the US are staying away from hurtling towards an all-out trade war; for now. In a notification issued on Monday, the Indian government claimed that it has deferred implementing higher tariffs on some goods imported from the US to November 2. India has shown immense restraint in retaliating against the US import tariffs on steel and aluminum. The US and India’s trade differences came to the fore after Donald Trump's protectionist approach for safeguarding America’s economic interests put him at odds with many countries. It began with Trump imposing a 25% duty on steel and a 10% tax on aluminum on EU, Canada, and Mexico. These tariffs hit products like plated steel, slabs, coil, rolls of aluminum, and tubes, along with raw materials used in US manufacturing, construction, and oil industry. Incidentally, Trump justified these tariffs on national security grounds. Obviously, this move roiled the European and North American nations and even cast a dark shadow on the G-7 meet held in June. However, the chief aftermath of Trump’s protectionist policies has been his relationship with China, the world's second-biggest economy. He took on the issue of trade balance with the eastern country by the horns, first announcing tariffs on $50bn worth of goods, then on another $200bn goods, and a further $200bn this week, effectively bringing most Chinese goods under his tariff net. Trump’s justification is simple. "China is engaged in unfair trade practices," he has said on numerous occasions. Trump believes that these tariffs will force China to rethink its policies due to the risk of economic harm. So, even though other countries have reacted in such a determined manner, why has India shown restraint? Let’s find out. After Trump’s announcement in May, New Delhi planned to impose tariffs on 29 US products, which included walnuts, almonds, boric acid, apples, diagnostic reagents, and some hot-rolled coil products, effective from August 4. However, they were delayed until September 18 as the two sides continued to hold meetings to ensure that an out-and-out trade war doesn’t happen. However, now, with the hopes of a solution acceptable to both rising, India has again delayed imposing tariffs on about $241mn of American goods by 45 days to November 2. Over a third of this comes from almonds, as India is the world’s biggest buyer of US-grown almonds. Under India’s proposed tariffs, American almonds and walnuts will attract 100% duty, pulses like chickpeas and Bengal gram will attract 60% duty, while apples will be at 50%. Trump has consistently claimed that India’s tariffs are the highest in the world, to the tune of 100% on some products, which covers a range of IT equipment, including circuit boards, screens and memory chips. So, have the two sides reached a truce? Not really. However, the two sides have been involved in frantic negotiations, with the US willing to exempt Indian steel and aluminum from tariffs, of course, under certain conditions. As the two sides make efforts to iron out the major irritants, Indian farmers and US manufacturers of medical devices will reportedly be the biggest winners. Last year, India imported a total of $863mn worth of medical devices and equipment from the US. This troubled the Indian administration, which termed the “high-profit margins” as "illegal profiteering,” even capping the prices for some heart stents. This led to US companies such as Abbott Laboratories, Johnson & Johnson (J&J), and Boston Scientific to go up-in-arms, vociferously criticizing this policy. Apart from this, the US wants to sell more almonds, cherries, and dairy products to India. 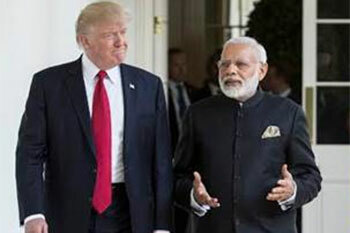 It is also urging PM Narendra Modi to lower input costs of IT components, allowing US companies to manufacture in India as part of his Make-in-India initiative. These issues were probably settled in the latest round of talks. Meanwhile, India is likely to benefit in the agricultural segment as Washington is expected to grant concessions which would make it easier for Indians to export products like rice, mangoes, table grapes, and litchis. New Delhi is also discussing ways to meet stringent US standards to sell bovine meat. The country has failed to make much of an impression in the US markets despite being the world’s biggest buffalo meat exporter. But why has the US been so large-hearted with India? An important reason could be that US companies are looking at the immense potential that India offers as it grows at an annual rate of more than 8%. With a young population and rising purchasing power, it is an emerging market that is waiting to be tapped. Further, its relaxation of tariffs for India isn’t a big deal as India is ranked 10th among the major steel exporting countries, with total exports at 16.3MT, according to the World Steel Association’s figures for 2018. What’s more, India exports just 10% of the steel that it produces. Now, it remains to be seen how the India and US steamroll their differences in the next 50 days and come to a substantial agreement on trade.